“Sam Raynor was the biggest slug that ever oozed across my path. 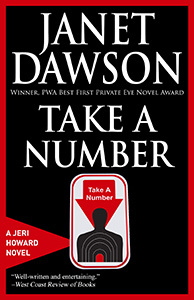 Anyone who wanted to kill him would have to take a number and get in line.” In Take A Number, Sam Raynor is indeed dead, and Jeri’s client is the number one suspect in a long, long line. It was just after noon on a bright hot August Friday when I met Sam Raynor for the first—and last—time. I watched the lunchtime crowd as I waited on the far side of the street-level fountain at City Center Square in downtown Oakland. Men in shirtsleeves and women in summer dresses sat on the edge of the fountain or on benches lining the terra-cotta-tiled pedestrian mall, eating sandwiches and salad from takeout containers. Office workers strolled among the trees, spooning up frozen yogurt as they enjoyed the sunshine and the break from work. Others lingered at the edge of the lower level fountain, where water cascaded down a series of steps near the entrance to the BART station. The splashing fountains pleased my ear as I watched this midday parade. I looked up at the modern sculpture above the nearby fountain. Constructed of outsized metal bars in lime green, pink, orange and red, it looked as though a giant hand had played a game of pick-up sticks, tossing the multicolored lengths into the air where they stayed, frozen in place against the cloudless blue sky, a counterpoint to the Tribune Tower on the other side of Broadway. Raynor was late. I looked at my watch, then swept the outdoor mall with a glance. He had proposed the meeting but I had picked the spot. It was neutral territory, with plenty of people around. I’d deliberately positioned myself on the far side of the fountain so I could observe him when he arrived. I had the advantage when it came to recognition. He’d never seen me before, but I’d been tailing him for days. Minutes ticked by. Then I spotted a figure in a summer white Navy uniform, walking toward the fountain. The sun glinted off his red-gold hair, the short curls hugging his skull like a nimbus. He moved with a slow confident strut that matched the cocky grin on his face, aware of the admiring glances he received from women as he cut through the crowd. He enjoyed the attention, basking in it like a lizard on a rock. Raynor stopped near the fountain and waited, left hand on his hip. His right hand tossed a key ring into the air and caught it. I approached him from the right, taking my time. I knew he was twenty-eight years old and that he was a first-class petty officer in the Navy, assigned to the Naval Air Station in Alameda. Until now I’d observed him from a distance, in crowds, across busy streets, through car windshields. This was the first chance I’d had to look at him up close. Six feet tall, I guessed, broad shoulders tapering down to a slim waist and muscular thighs. His pale freckled forearms were covered with the same curly copper hair. He had long blunt-fingered hands. I particularly noticed his hands. He jumped slightly, as though startled by my sudden appearance. I couldn’t tell if it was real or if he knew I’d been watching him. His eyebrows went up and he tilted his head to one side, a smile playing over his full sensual lips. “You must be Jeri Howard,” he said, his voice pleasant and purring as he tried hard to be disarming. “Nice to finally meet you.” He stuck out his hand. I kept mine at my side. He cranked up the smile a couple of watts and leaned toward me. I felt as though I were too close to a high intensity light bulb. I stared at him as though I were a scientist examining some alien life form slithering from a petri dish. Raynor’s smile dimmed just a bit. He looked earnest and concerned. “California’s a community property state,” I said. As Raynor talked, he leaned closer still. I could smell the acrid musky scent of his after-shave and see the spatter of freckles on his fair skin. His left hand moved, a slow stroke down his hip to his muscled thigh, coming to rest in too-casual proximity to the bulge in his crotch. He tilted his head again and watched me through heavy-lidded eyes, his tongue darting like a snake between those full smiling lips while his pleasant-sounding voice tried to convince me of his sincerity. His body language was intended to convince me of something else entirely. His eyes gave him away. I suppose someone once told Raynor he had bedroom eyes, whatever that means. But Raynor’s eyes were a flat pale blue, like disks painted on the face of a porcelain doll, devoid of warmth and emotion. They certainly engendered no passion. When they weren’t gazing at me or curtained by their lashes, those eyes flicked around the courtyard, zeroing in on other women nearby. He reminded me of an actor, counting the house. As he spoke, the fingers of Raynor’s left hand played invitingly over his crotch. His right hand tossed the keys into the air, a jangling accompaniment. When he got to the line about wanting to see Ruth, to talk to her and convince her that the divorce was a mistake, I cut him off with a sharp gesture and an ice-cold voice. He tossed the keys into the air one last time. When he caught them his right hand balled into a fist. He shoved the fist under my chin. His eyes held some emotion now. It was like staring into the blue flame on a gas stove, into the heart of a fire fueled by hatred. The hatred was directed at me, at his wife and her attorney, at women in general. I suspected it was also directed at anyone who thwarted Sam Raynor or interfered with his view of himself as the center of the universe. He spewed venom at me, working his way through the alphabet, calling me all the names I’d heard and some I hadn’t. He warned me to stay out of his business and threatened me with what he’d do to me if I didn’t. He gave off sparks, adding to the heat of the day. But he didn’t touch me. Evidently he was saving that for later. I felt a hot flush of anger, then cold, hardening resolve. One of these days, I thought, this guy is going to kill someone. Or vice versa. I folded my arms across my chest and stared back at him with a look I usually reserve for cockroaches, choking down the urge to lash back. Instead I let him do all the talking, if you could call it that. I had no intention of backing down, from this case or from Raynor himself, if I had to stand in this courtyard all afternoon. No, Sam Raynor would get what was coming to him. If I could help that day arrive sooner, rather than later, I’d do so with great enthusiasm. And gain more satisfaction from that than I would if I kicked this jerk in his precious balls. Finally he ran out of words, frustrated by his failure to stampede me. His tongue darted over his full lips again, only this time he hissed at me like some deadly snake, at bay but still able to strike. The blue eyes slashed at me, then Raynor turned and walked away. I watched until he was out of sight. Only then did I relax, surprised at how rigid my muscles had become. I walked across the square, heading in the direction of my Franklin Street office, splashed by an errant spray from the fountain. I felt as though I needed a bath.